HSS is dedicated to developing proven performance-enhancement solutions that are healthy, all-natural & preferred by elite athletes. Our Athlete Sweat Test determines your unique hydration needs, and our LEVELEN™ Electrolyte products assure optimal performance through fluid & electrolyte balance. Why Should I Get A Sweat Test? Based on over 15 years of research, and data on thousands of athletes across numerous sports, athletes simply don’t sweat the same. General hydration guidelines are just that, general, and aren’t useful for helping the athlete determine their unique fluid and electrolyte needs. Your Sweat Profile is uniquely yours, and could differ dramatically from another (over a hundred fold), even if they have a similar diet, body type, size, etc. There are no metrics that can accurately predict what your hydration needs are, which is why a Sweat Test is so essential for those seeking to optimize their performance and minimize heat-related illnesses like heat exhaustion, hyponatremia, and muscle cramping. Our Testing Kit is self-administered, and provides us enough information to determine your unique hydration and electrolyte needs, down to the milligram. Buy an Individual Sweat Test, and take your performance to the next LEVEL. What Are Electrolytes? How Do They Help Me? Electrolytes are essentially salts that can carry an electrical charge. The cells in your body rely on electrolytes to control cell membrane stability and to carry the electrical charges needed for muscle contractions caused by nerve impulses. Without electrolytes, the cells in your body couldn’t communicate with each other or perform these essential functions. Adequate function of the nervous, cardiac, digestive and muscular systems all depend on a proper balance of electrolyte levels. Both normal body function, and athletic performance, are severely compromised if adequate levels of electrolytes are not present, especially in the heat. One of the most obvious (and painful) signs of electrolyte loss is muscle cramping. But, muscle cramping is usually a sign that you missed your chance to maintain a proper electrolyte balance. Cramping is one of your body’s last warnings that it cannot continue normal muscle function without electrolyte replenishment. By the time you feel cramping, your performance has already been diminished for some time. The problem can get worse than just muscle cramping. When your muscles cramp, this is caused by over-excited positive power charges in muscle cells, struggling to do their job with depleted electrolytes, just like a light flickering before it burns out. Severe and sustained muscle contractions caused by these unpredictable power surges can cause muscle pulls or strains, as your muscles involuntarily contract. These severe, sustained and involuntary muscle contractions can not only result in muscle damage but will decrease performance or disrupt exercise entirely. Maintenance of your electrolyte balance can help avoid these potentially severe problems. Maintaining proper electrolyte balance isn’t just for athletes who’ve suffered from debilitating muscle cramps or pulled muscles. You need to provide your body with an adequate supply of electrolytes to maintain specific bodily functions, so you can perform at your peak. To ensure peak performance, you need electrolytes sending a steady stream of energy to all the cells in your body, to keep your body performing smoothly, without interruption or decreased power. No serious athlete should wait until the final signs of severe electrolyte depletion before replenishing electrolytes. You need to get out in front of electrolyte loss and maintain it before it becomes a performance problem. An Individual Sweat Test is one of the simplest ways to determine the concentration of electrolytes in your sweat, allowing you to customize your replenishment program. Buy an Individual Sweat Test to determine your body’s specific hydration & electrolyte needs, and take your performance to the next LEVEL. Are All Electrolytes Created Equal? Electrolytes are salts that help your body perform essential functions. As you sweat, your body tries to naturally regulate the balance of electrolytes. In some cases, your body does this very well. For instance, when you train or compete, your muscle fibers break down. When your muscle fibers break down, potassium is released into the body. Your body does this very efficiently, even at modest levels of activity. So, potassium is not an electrolyte you need to worry about replenishing. Your body does that for you. Many sport drinks and endurance products contain potassium, which is one of many ingredients you don’t need, even for endurance athletes and muscle crampers. In fact, abnormally elevated blood potassium (hyperkalemia) can be very dangerous, even fatal. We recommend avoiding any supplementation of potassium. Your body is less efficient at balancing other electrolytes like sodium (Na+), chloride (Cl-), and magnesium (Mg+). These electrolytes can quickly be depleted as you train or compete, leading to performance issues or muscle cramping. These electrolytes are key ingredients in LEVELEN™, in just the right amounts for you. This ensures you maintain your peak performance by managing the most essential electrolytes, while avoiding those which are less beneficial, or even harmful. How Much Does Sweat Vary Between Athletes? The amount of sweat volume (rate of fluids lost) can vary greatly from one athlete to another, over a 37-fold difference. While sweat rate is slightly correlated to size (larger athletes typically sweat more) and gender (males sweat more than females), two athletes of similar size and gender can have very different sweat volumes. That is why sweat testing is critical for determining your exact fluid and electrolyte replenishment needs to maintain peak performance. Sweat volume may vary considerably between sports, as well as between players in the same sport. When assessing sweat volume between runners and football players in identical conditions, our research revealed that football player sweat losses were over 9 liters per day compared to 3 liters per day for runners. The graph below highlights electrolyte loss data from our research with the Philadelphia Flyers and the Philadelphia Eagles. As you can see, there was a dramatic variance in the overall amount of electrolytes lost (in this case sodium) from one athlete to another. Measured in milligrams per hour, there was over a 100-fold difference in electrolytes lost between athletes tested in our research. From athlete to athlete, individual electrolyte loss varies much more than fluid loss. As electrolyte depletion begins, there can be a gradual and subtle loss of performance. As electrolyte depletion becomes more extreme, debilitating muscle cramps can suddenly set in. For every athlete, the point at which performance is impaired or muscle cramps start is different. Guesswork is not the answer for maintaining your electrolyte balance. One-size-fits-all electrolyte solutions are not the key to your peak performance. Sweat testing is the only way to know exactly what you need, and The LEVELEN ERS™ is the only integrated solution of testing and LEVELEN™ electrolyte replenishment products customized to your individual needs. Does My Sweat Profile Change? How Often Should I Test? Year over year: If you were tested today, and the same time last year…our studies indicate your results would be the same. The test is very accurate and allows for precise recommendations of your customized electrolyte replenishment solution. However, if your diet, weight, medications or level of activity change dramatically, this could affect your sweat composition. We recommend re-testing annually to ensure accurate recommendations of LEVELEN™ products. Season to season: As the weather warms and cools, your body “acclimates” to new temperatures and humidity changes. In cooler weather, you typically sweat less with a higher concentration of electrolytes lost. In warmer weather, you tend to sweat more with a lower concentration of electrolytes. If you are a multi-season or multi-sport athlete, it is a good idea to perform several sweat tests per year to ensure you are replenishing the correct amount of electrolytes, based on the sport and/or weather conditions. For the serious athlete, this “fine tuning” dials in your hydration specifically to a workout, providing you with that extra edge. Buy Multiple Sweat Tests (at a discount) to determine your body’s specific hydration & electrolyte needs, and take your performance to the next LEVEL. Where do I send my Sweat Test sample? Mail the completed information card & sweat sample back to us in the provided return mailer. Take a picture of the tracking label, in case your sample gets lost in the mail. Please get a tracking number and let us know that your sample is coming (support@levelen.com). What is a Simulated Sweat Test? How Does LEVELEN’s Test Differ? Stimulated sweat tests are static tests that are medically approved for detecting Cystic Fibrosis. The problem with this method, in terms of athletic performance, is that the sweat composition generated by an artificial stimulus differs greatly from a true sample taken during physical activity. Eccrine sweat glands are stimulated when the body is hot (physical activity), and sweat produced by eccrine glands will have different electrolyte levels from aprocrine glands. Numerous studies have shown that this stimulated method results in elevated levels of electrolyte concentration, and not representative of true thermal sweating. These studies also measure chloride concentrations, and then estimate sodium and overall electrolyte levels. We analyze each electrolyte independently, for a more accurate measure, rather than estimating anything. Even though Chloride and Sodium levels tend to correlate, we have seen many instances when the two differ greatly on our scale. This would result in grossly incorrect measurements from the stimulated sweat test. We recommend you test in an environment similar to your normal training/competition conditions. We then customize your hydration & electrolyte replenishment program to address this authentic specific sweat profile, and not one from stimulated sweat. My Blood Test says I’m “normal”, why do I need a Sweat Test? When it comes to electrolytes, your body is very good at regulating your levels. Usually within an hour, your sodium and chloride levels will have returned to normal levels, even after suffering muscle cramps during competition. Our sweat test determines what your real-time losses will be, so we can scientifically replenish based on your specific needs and assure your levels will never drop below normal during an event. A blood test does not provide the real-time information needed to determine an individual’s specific fluid and electrolyte needs. For example, your blood sodium levels should be 135 mmol/L to 145 mmol/L. Whether you are a muscle cramper or not, your blood tests will most likely be within this range. How Do I Perform a Sweat Test? Just like elite professional & collegiate teams and athletes, you can now determine your unique sweat profile (sweat rate & electrolyte loss), and end the electrolyte replenishment guessing game. Our LEVELEN Electrolyte Replenishment System (ERS™) is the only integrated solution of sweat testing and electrolyte replenishment products customized to your needs. The video below details how to perform a self-administered sweat test. Once we receive your test sample and analyze it, you will receive a detailed Sweat Profile Report and Dashboard. This includes an hourly hydration strategy and specific recommendations of LEVELEN™ products that are customized for your specific electrolyte replenishment needs. Important: During this test, consume fluids as you normally do for a workout of typical intensity and duration (If you maintain or gain weight during your test, you are overhydrating, and will need to redo the test within reduced fluid intake). You need to record the precise amount of fluid consumed during the full duration of your workout (between your pre- and post-workout weighings). For the most representative results, you should perform the sweat test while training in the activity, intensity, and environmental conditions representative of the competition you are training for (e.g. Marathon training by running on a hot day). 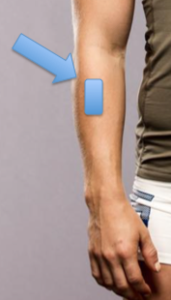 Apply “sweat patch” to cleaned area outside of your forearm just prior to the workout. Put the “SweatTest” sticker on the patch, and please share your test on social media (Tag LEVELEN4U on Instagram or Facebook). Empty bladder and weigh yourself (wearing no/minimal clothing), noting weight on information card. Note workout conditions on information card (temperature and humidity, if possible).REMEMBER: From this point until you record your post-workout weight, you must track how much fluid you consume (in ounces or milliliters). You should be losing weight, so if you’re maintaining or gaining weight, you’re drinking too much, and you’ll need to redo the test. It is best to remove the sweat patch when the gauze is fully saturated, usually between 30-45 minutes after your workout begins. Peel open the sweat patch and remove the gauze only with the provided tweezers to avoid touching the sample. Place the gauze only into the plastic vial, close lid so it “snaps” securely, and place contents into clear bag and seal. Continue your workout. After your workout, wipe off sweat and weigh yourself again (wearing minimal or no clothing). Note weight, test duration and intensity, and fluids consumed, if any, on the information card. The Sweat Test measures your sweat volume (sweat rate) and sweat composition (electrolyte concentrations). Both measurements are instrumental in understanding how your body reacts to exertion and what specific replenishment you need to maintain proper electrolyte balance under physical stress, as well as preventing heat-related illness. Based on your results, we determine the amount of electrolytes lost in sweat that need to be replenished, down to the milligram. No more trial-and-error guessing with your hydration. Why Do I Need to Weigh Myself? Sweat Rate. In order for us to get an accurate measurement of your sweat volume, it is important to weigh yourself both before and after the duration of your workout. Since sweat can be absorbed in your clothing, you should weigh yourself with minimal/no clothing. For the post-workout weight, please wipe off any sweat before weighing out. Your workout should ideally last for an hour. The difference in your weight before & after your workout is the total amount of fluid lost in your sweat when you exercise. When you’re training or competing, you need to replenish those fluids. More importantly, what you drink must replenish the electrolytes lost to maintain peak performance and endurance. That is why we test for BOTH sweat volume & electrolytes lost as part of the Levelen ERS™. This will allow us to determine your sweat rate for a given race condition. Why Do I Measure How Much I Drink? Sweat Rate. In order for us to get an accurate measurement of your sweat volume, we need to determine how much you consume during your workout. The amount of fluid you consume will affect your post-workout weight. During the test, if possible, we recommend not drinking any fluids. This allows us to attain the most accurate reading of your sweat rate/volume. We recognize that hydration may make you more comfortable during your workout, and be necessary for longer or more intense workouts. If you do drink fluids during the test, carefully enter the exact amount that you consumed on the information card provided with your Sweat Test Kit. This allows us to accurate measure your Sweat Rate, and compensate for your fluid intake. How Do I Calculate My Sweat Rate? Weights should be in kilograms, volume in liters, time in hours. How Long Do I Wear the Sweat Patch? The Sweat Patch is used to collect a sample of your sweat, so we can analyze and determine the concentrations of various electrolytes in your sweat. We highly recommend that you keep the patch on for at least 30 minutes, and up to a full hour. You should work out continuously the entire time. Your test should be conducted in similar conditions as your usual workout (e.g., level of intensity, indoors vs. ourdoors). We recognize this may require you to wear the patch longer, for instance if you are a long distance runner or cyclist. Please try to plan your training routine so the test is as close to one hour as possible. This will help avoid your patch from becoming over-saturated with sweat. Once you complete your LEVELEN™ Sweat Test, you will receive an e-mail with your detailed Individual Sweat Profile and Dashboard. Your Recommended Fluid & Electrolyte Replenishment Program will be based on your Individual Sweat Profile, the Duration of your workout/competition, and your specific Sport/Activity. You will use this individualized information to calculate the amount of fluid intake you will need, and the amount of electrolytes you need to replace during your workout or competition. Determine the Duration of your workout or competition. Multiply Duration with Recommended Fluid Intake (on Dashboard. this is NOT your Sweat Rate. Your Recommended Fluid Intake is 60-70% of your Sweat Rate). This is the TOTAL fluid and electrolyte deficit that will need to be replenished, to maintain optimal hydration and electrolyte balance. This total amount should be spread out before, during, and after your workout, depending on the type of activity (see below). Duration: 5 hour training session of swimming (1 hr), cycling (2 hrs), and running (2 hrs). Your Recommended Fluid Intake is 1.2 liters per hour. Before: Starting up to 24 hours prior to your workout, drink 35-40% of total = 2-2.5 liters of LEVELEN™ Level 4 over the 24 hours. During: Drink 35-40% of total during cycling leg = 2-2.5 liters of LEVELEN™ Level 4 during the cycling and running sessions. If you do not have access to LEVELEN during the run, over concentrate 2-2.5 liters worth of LEVELEN Electrolyte Mix into your bike’s water bottle, and drink water during the run. After: Drink 20-30% of total after your training session = 1-2 liters of LEVELEN™ Level 4. Your Hydration & Electrolyte Replenishment Program will depend greatly on your Sport & Activity. See below for your recommendations based on sport. Begin Levelen™ preparation 24 hours prior to game time or an intense practice. For athletes whose Sweat Volume/Fluid Loss test results are “Severe,” begin Levelen™ preparation 36 hours prior to game time or an intense practice. Levelen™ preparation should be at the rate of fluid consumption noted in your hydration recommendations. While on the field, continue to consume available fluids (typically water) at the rate noted in your hydration recommendations. During two-a-day practices, or intense daily practices, your 24- or 36-hour Levelen™ preparation periods & practices may overlap. It is essential to maintain your electrolyte levels & remain hydrated during these continuous periods of intense physical activity. In this case, consume Levelen™ continuously throughout this period, at your recommended rate, until two-a-days or daily practices are complete. As always, the goal is to continue rehydrating with available fluids at the rate noted in your hydration recommendations. Begin Levelen™ preparation 24 hours prior to game time or an intense practice. For athletes whose Sweat Volume/Fluid Loss test results are “Severe,” begin Levelen™ preparation 36 hours prior to game time or an intense practice. Levelen™ preparation should be at the rate of fluid consumption noted in your hydration recommendations. While on the field, continue to consume available fluids (typically water) at the rate recommended in your test results. If it is possible to have your own Levelen™ supply on the bench, consume Levelen™ at the rate noted in your hydration recommendations. If not, continue to consume available fluids (typically water) at the rate noted in your hydration recommendations. During tournament play, playoffs or intense daily practices, your 24- or 36-hour Levelen™ preparation periods & physical activity may overlap. It is essential to maintain your electrolyte levels & remain hydrated during these continuous periods if intense physical activity. In this case, consume Levelen™ continuously throughout this period, at your recommended rate, until tournament, playoffs or intense daily practices are complete. As always, the goal is to continue rehydrating with available fluids at the rate noted in your hydration recommendations. Endurance sports typically involve extended periods of exertion for which consistent electrolyte management & hydration is essential. Cyclists have the advantage of being able to carry Levelen™ on the bike, which helps provide consistent electrolyte replenishment throughout your ride. Begin Levelen™ preparation 24 hours prior to competition or intense training. For athletes whose Sweat Volume/Fluid Loss test results are “Extreme,” begin Levelen™ preparation 36 hours prior to competition or intense training. Levelen™ preparation should be at the rate of fluid consumption noted in your hydration recommendations. To ensure optimal recovery after training or competition, continue consuming Levelen™ at your recommended rate for the following periods of time according to your reported Sweat Volume/Fluid Loss test results: Low/Mild 6 hours, Moderate/Significant 12 hours, Severe 24 hours. For longer rides, carry individual servings of Levelen™ with you to mix with water mid-ride. If this is not possible, extend your Levelen preparation up to 36 hours prior to competition or intense training. Beyond 36 hours prior, Levelen™ will not provide any added benefit during training & competition. As always, the goal is to continue rehydrating with available fluids at the rate noted in your hydration recommendations. Endurance sports typically involve extended periods of exertion for which consistent electrolyte management & hydration is essential. For longer distance runs (e.g., half-marathon distances or more), it can be difficult to supply yourself with anything other than water available on course. So, pre- & post-run preparation with Levelen™ is critical, at the rate of fluid consumption noted in your hydration recommendations. Begin preparation up to 36 hours prior to your longest events or intense training, and 24 hours prior to middle/short-distance events or intense training. Beyond 36 hours prior, Levelen™ will not provide any added benefit during training & competition. To ensure optimal recovery after training or competition, continue consuming Levelen™ at your recommended rate for the following periods of time according to your reported Sweat Volume/Fluid Loss test results: Low/ Mild 6 hours, Moderate/Significant 12 hours, Severe 24 hours. As always, the goal is to continue rehydrating with available fluids at the rate noted in your hydration recommendations. Levelen™ will not provide any added benefit during training & competition. To ensure optimal recovery after training or competition, continue consuming Levelen™ at your recommended rate for the following periods of time according to your reported Sweat Volume/Fluid Loss test results: Low/Mild 6 hours, Moderate/ Significant 12 hours, Severe 24 hours. As always, the goal is to continue rehydrating with available fluids at the rate noted in your hydration recommendations. CrossFit is an intense activity over a short period of time. Since the activity is so short, electrolyte management & hydration preparation is essential for optimal performance during the workout. Begin preparation up to 24 hours prior to your workout and consume Levelen™ through your workout. Add Levelen™ Neutral to your post-workout drink/protein shake for optimal electrolyte balance. As always, the goal is to continue rehydrating with available fluids at the rate noted in your hydration recommendations. What Is In the LEVELEN Formulation? LEVELEN™ Electrolyte Drink Mix is custom formulated with the right amount of electrolytes based on your specific needs, as determined by your Individual Sweat Test. The formulation includes healthy, all natural ingredients found through over 15 years of research to be valuable in enhancing performance, preventing muscle cramps, aiding recovery, and avoiding heat-related issues. The most rapidly depleted electrolyte is sodium (Na+), and sodium loss is the primary electrolyte that we assess in our sweat testing. Chloride (Cl-) is lost at a highly predictable rate based on sodium loss. Magnesium (Mg+) is also essential for cell membrane transfer to ensure electrolytes and fluids are retained by your body. All of these electrolytes are key to our formulation. The formula avoids ingredients previously thought to be beneficial, but in reality are detrimental and even harmful when taken in large amounts, such as potassium. We include Dextrose instead of sucrose, fructose or high fructose corn syrup to facilitate electrolyte absorption and minimize gastro-intestinal distress associated with digestion of complex sugars. LEVELEN™ ingredients are “clean” and suitable for athletes to take. None of our ingredients appear on the anti-doping list. Individuals with Hypertension, Renal Disease or those taking Diuretics should consult with a physcian before taking LEVELEN™. Additional Ingredient and Nutrition information can be found on the LEVELEN™ Electrolyte Mix page. Why Doesn’t LEVELEN have Potassium? Potassium deficiency does NOT lead to muscle cramping. Even though we lose Potassium in our sweat, our body is naturally able to keep Potassium levels balanced, without supplementation. In fact, supplementation can lead to abnormally elevated blood potassium (hyperkalemia), which is extremely dangerous and potentially fatal. We believe it is best to avoid Potassium supplementation, and therefore, do not include any in our formulations. The absence of Potassium does not affect our ability to prevent muscle cramping. Do I Need to Be Concerned About Consuming High Amounts of Salt? 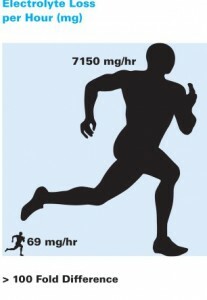 Competitive athletes can lose excessive amounts of salt, but it is highly individualized. Knowing exactly what you lose is the key to successful replenishment and optimal performance. The LEVELEN ERS™ is designed to address your specific needs, so high salt intake should not be an issue. The goal is to replenish what you lose, rather than take on unnecessary sodium and other electrolytes. Without determining your specific electrolyte needs through a LEVELEN ERSTM Sweat Test, electrolyte replenishment remains a trial-and-error guessing game. Can I Still Eat Salty Food When Using LEVELEN™? In most cases, you should maintain your normal diet. Remember, the goal is to use LEVELEN™ immediately before and during training & competition to replenish electrolytes that you lose. So, at all other times when not training or competiting, you should maintain your normal, healthy diet. There are some individuals whose test results will reveal the need for more extreme electrolyte supplementation, and for those, we will recommend increasing salt intake in their diet, in combination with using LEVELENTM Custom Electrolyte Mix during training/competition. These individuals should not be concerned about avoiding salt, particularly right before an intense workout. Contact support@levelen.com with any other questions.